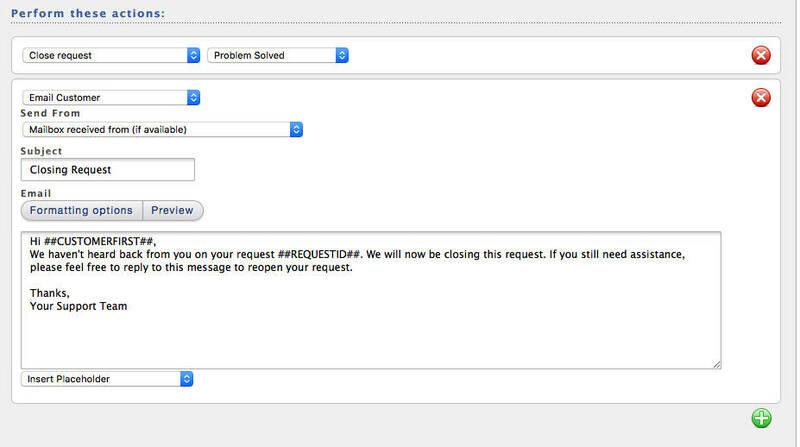 Making sure that requests get closed properly is a key to a smooth running helpdesk. Having resolved requests remain open in your helpdesk clutters your workspace and skews your reporting. Often times you may be waiting on a reply from a customer that never ends up responding. Today, I'll show you an easy way to automatically close these requests and get to the requests that need your attention. The ideal tool for automatic events like this is HelpSpot's automation tool. Automations allow you to run actions against a set of requests that meet criteria on a scheduled basis. For more details on how the technical parts of automations work check out this knowledge base article: task2.php explained. To get started, lets navigate to Admin ➭ Triggers and Rules ➭ Automation Rules. Once we are in the automations area we can start by creating a new automation. Each organizations criteria will be different for when they want to auto-close requests. For this example we will say that we want to close request that have a status of waiting for response and haven't been updated in 3 days. In the automation's setup we'd configure that like this. You will notice that in this screenshot we also have the condition that the request is open. This is important because automations need to have a criteria that will no longer be met after it completes it's actions. Otherwise, the automation would continue to run indefinitely. In this case, since we are closing the request, checking if the request is still open will prevent an automation loop. We can now add our actions to the automation. As noted, the first action that we will add is to close the request. We can also add another action such as emailing the customer a notification that their request is being closed. I've included an example of this in the screenshot below. You'll want to use the test criteria button to see what requests will be affected. Be sure to check this carefully as the automation will begin functioning immediately after it is saved. After saving your automation you should be all set. Requests will begin to automatically close when the configured criteria are met.